This is a fantastic recipe that I am definitely adding to my regular rotation. Huge thanks to the recipe I worked from Five Heart Home. This gal has amazing ideas and a humorous way of describing her OCD process of baking. This would be an awesome Valentine’s day treat to make for your lover or with your lover. You could also make it and not tell anyone–more for you! It may look like a lot of steps but it is really pretty easy to throw together. I might just make it again in a few weeks…heh heh. Reminder: if milk and eggs are room temperature they tend to blend better with the melted chocolate. Lay all your ingredients out. If you are using an old stale loaf lying around the house then first cut it into 1″ cubes and put them into your preferred baking dish. Eight cups is around right for a 9×13. I wanted to give part of my dessert as a gift so I split my bread into an oval glass baking dish (9×9?) and a glass loaf pan. Note, you may want to grease your pan, bt I noticed no issues using my glass pans. 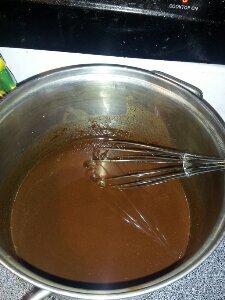 Melt 1 1/2 cups of chocolate chips on medium low in a saucepan with 1/2 cup strong brewed coffee. Keep an eye on the chocolate and stir periodically. When it becomes smooth (no chip lumps) turn it off and allow to cool. In a large bowl beat 4 room temp eggs. 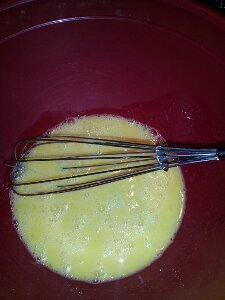 Add vanilla, brown sugar and half and half. Combine well and then stare down your chocolate until it cools down. 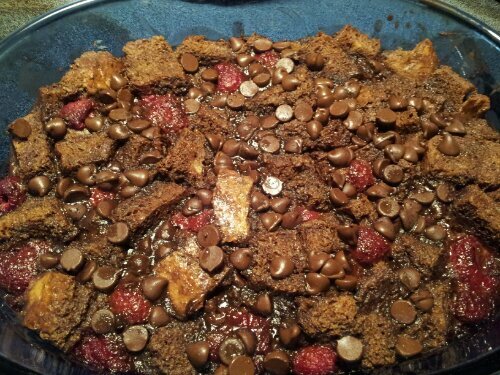 Mix chocolate into large bowl with the rest of the ingredients. 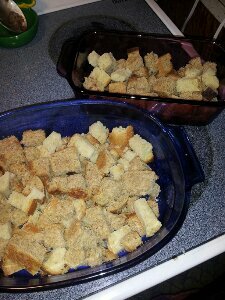 Pour prepared mixture over stale bread in pan. Pour evenly if possible. If you used a white bread it will be easy to tell if you haven’t soaked a corner piece. 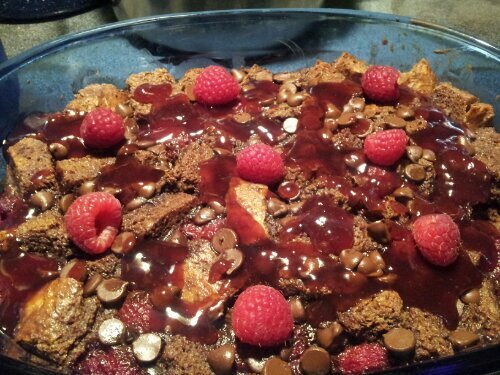 Reserve a few raspberries from the carton for the topping if you wish. I think the flavor is better baked in though. Place berries evenly around pan and mash into pudding with fingers or a fork. Sprinkle reserved 1/2 cup chocolate chips evenly on top. Bake 30-45 minutes in the oven. You can do the knife test to make sure the pudding is baked through. Mine was perfect at 30 minutes but the original recipe said to bake up to an hour. Warm seedless raspberry jam in a saucepan (I don’t own a microwave) until you get a nice smooth sauce. 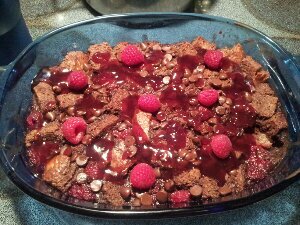 Drizzle over top of your hot bread pudding and if you wish, throw the reserved fresh raspberries on top for presentation. • If you’re worried about the pudding drying out when you reheat it cover the pan with tinfoil. • *As the original blogger noted, you can use a heavy whipping cream of lighter milks if you’re worried about the caloric overload. • This is not a sweet overload, but there is plenty in there to make it sweet. If you would rather a less sugary dessert you could reduce the brown sugar to 1/2 cup and be just fine. • I used strong brewed coffee because I don’t keep instant coffee granules around the house. When I know I want to bake something chocolatey soon, I brew a few extra cups in my coffee pot. Best way to use old coffee ever. • Even if you’re not a coffee drinker, don’t spazz, do add it. Coffee enhances the chocolate. Hubbster hates coffee but couldn’t taste it in the pudding and loved the whole thing. • If you plan on baking all the raspberries you could save a little cash and go with frozen berries. Or if the seeds bug you, put small dollops of seedless jam in the pudding prior to baking.